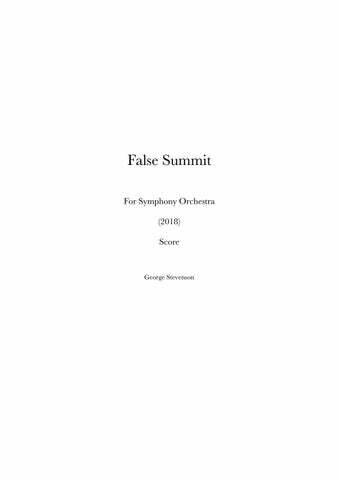 False Summit was written for the London Symphony Orchestra through the LSO Discovery Panufnik Composers Scheme, generously supported by Lady Hamlyn and the Helen Hamlyn Trust. The piece is dedicated to my great-grandfather, the mountaineer and author Charles Francis Meade. Strings (14.12.10.8.6***) * Flutes 1 and 3 require B footjoints, if possible. ** Harp requires medium-thickness guitar plectrum to scratch string. *** Double basses require C-extensions, if possible. * Use medium-thickness guitar plectrum to scratch string from top to bottom, throughout indicated duration. A (h) ord. molto sul pont. ord. non-div. molto sul pont. (div.) ord. molto sul pont. * Shake with smooth transitions between slow shake (approx. semi-quavers) and fast shake (as fast as possible), irrespective of notated duration. 3 2 8 œ œ ≈ 4 œ bœ œ œ >. ≈ œ œ œ œ. > >. ‰ œ œ œ b œ œ. 2 4 4 œ # œ ≈ ≈ ≈ œ nœ. ≈ #œ #œ #œ 4 ‰ > > . œ nœ bœ bœ . ≈ nœ nœ nœ > . œ œ œ b œ. 5 Temple Blocks soft sticks (Suspended Cymbal) l.v. Perc. 2. I (e = 176) 50 Picc. Crotales l.v. sempre Perc 2. 3 j nœ œ œ œ 8 œ. 3 j œ b œ œ œ 8 œ.
ppp pp f p ppp sub. bœ bœ œ #œ bœ. œ œ™ œ œ œ œ. ≈ bœ bœ œ #œ bœ. œ bœ œ #œ bœ. bœ œ œ œ œ.
bœ bœ œ œ #œ bœ bœ. bœ bœ œ œ œ œ bœ. bœ bœ œ #œ bœ . bœ œ œ œ #œ œ.
œ œ œ œ œ œ œ.
Risoluto (stesso tempo) rit. ﬂz. div. a 3 arco unis. j l.v. œ ‰ . harm. trill* fast slow 1. 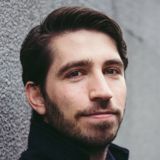 Db. lunga Desks 2. 3. * Trill between artiﬁcial harmonic and fundamental, with smooth transitions between slow trill (approx. semi-quavers) and fast trill (as fast as possible).